Volkswagen factory ground breaking, Hambantota Harbour lease in Jan. 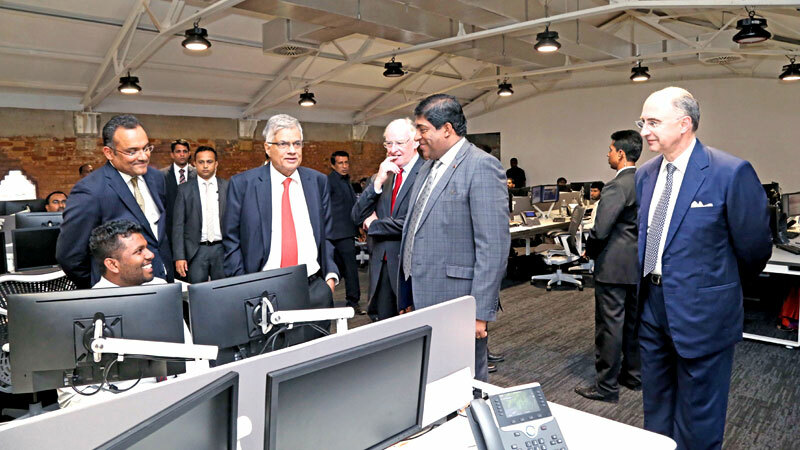 The investment in Sri Lanka by London Stock Exchange Group (LSEG) technology facility is a clear example of the investment confidence foreign countries have on Sri Lanka, Prime Minister Ranil Wickremesinghe said. Speaking at the opening of the LSEG Technology Facility at the TRACE Expert City yesterday he said that unity governments formed by two rival political parties is not something very common in the world but it’s a success story in Sri Lanka. He also said that LSEG technology facility is a clear example of investeor confidence for the government. “I must also say that in addition to the London Stock Exchange Group, the Volkswagen Company from Germany will also lay the foundation for their factory in Kurunegala in January and another global company too will stamp its foot print in Kurunegala early next year. The premier also said that in addition the new lease deal for the Hambantota Harbour with a Chinese counterpart too will be inked in January and the Trincomalee Port city development with the assistance of Japanese and Singapore will commence early next year. LSEG will indirectly offer employment to over 1,200. These employees will be tasked with providing technical support services for the Group’s global network.London Stock Exchange Group has extensive experience of working in Sri Lanka through its global trading and technology business, MilllenniumIT, based in Colombo and Malabe. LSEG Chairman Donald Brydon said that he was delighted to join the Prime Minister for the opening of our new technology facility,which will provide the best and brightest technology talent in the country with the opportunity to join a truly global markets infrastructure business. “Given our long history and verysuccessful experience of working in Sri Lanka, it is the natural destination for LSEG’s new business services technology division. “We would like to thank the government of Sri Lanka for their support in this venture and look forward to further developing a world leading technology hub in the country”. Headquartered in the United Kingdom, with significant operations in North America, Italy, France and Sri Lanka, the Group employs approximately 3,500 persons. Prime Minister Ranil Wickremesinghe said the state-of-the-art facility to support LSEG’s global technology operations facility in Maradana will provide employment for over 400 Sri Lankans under the first stage and a further 200 under the second stage. He said that Sri Lanka has talented youth to supply to the LSEG technology at the TRACE Expert City. “The employees’ salaries will be definitely over than that of the the Prime Minister’s,” he quipped.